Henderson Community Foundation is a recognized 501(c)3 corporation in the state of Nevada. 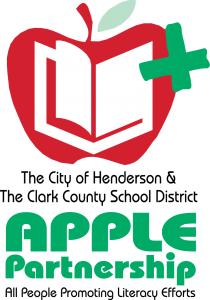 APPLE (All People Promoting Literacy Efforts) Partnership is an ongoing effort that actively works to bring community resources to schools, teachers and parents in a proactive way to help families help children learn how to read. Desert Winds provides educational outreach to advance the appreciation of wind and percussion music through the performance of contemporary music as a rendering of today’s societal expression. Dr. Joel & Carol Bower School-Based Health Center, located in a portable building in the student parking lot of Basic HS, provides free primary health care for all students attending Basic H.S., Robert L. Taylor E.S., C.T. Sewell E.S., Mahlon B. Brown J.H.S., and other neighboring Henderson public schools. The health center offers a wide range of services including first aid, immunizations, physicals, treatment of illnesses and asthma and diabetes support. Nurse practitioners, nurses and health educators from the Nevada State College Nursing Program provide these services in cooperation with physicians. The mission of NevadaCSI is to raise private funds to design, build, and equip a publicly-owned, operated, and maintained Forensic Science Center. The primary purpose of the Center is to provide our community with appropriate levels of forensic laboratory services, accurate and timely evidence analysis and reporting, and crime scene investigation/processing to enhance public safety. An educational partnership with a local college/university will provide unique opportunities for future forensic science practitioners; increase their exposure to the use of physical and life sciences in forensic applications; help guide students and graduates to potential careers in areas that will help others; increase opportunities for future employment; and encourage Nevada’s students to remain and work in our state. The Friends of Henderson Parks & Recreation wish to enhance the quality of life by supplementing recreation efforts in the City of Henderson. Friends of HPD SWAT was created to provide assistance to one of the most critical aspects of police duties in the City of Henderson. Support will assist with equipment and other items that will enhance the safety of the Henderson community along with the SWAT Officers themselves. Assists nonprofits with feline overflow by providing a no-cage, no-kill sanctuary and foster program with forever sanctuary for non-adoptable felines. Sanctuary includes: separate canine and feline indoor/outdoor space; kitten rehab/adoption area; chicken coop; fish rescue pond; and horse stall. A wild peacock/peahen habitat is in process. Assistance also includes spay/neuter support to neighborhoods and medical/food support to adoptive families on limited incomes. The funds donated to the Animal Shelter are being used for our School Education Program, promotion and implementation of Adoptathons, special veterinary supplies for expanded service, specialized non-lethal capture and safety equipment to help the Animal Control Officers with capture of feral or wild animals and special needs for shelter animals. The Henderson Coordinated Community Response is a network of public and private agencies working toward the prevention and protection of victims of domestic abuse. The Henderson City Attorney’s Office spearheaded this coordinated effort by engaging various public and private agencies to work closely with law enforcement, domestic violence support groups, and other community resources. The military families program is designed to assist families who have a Henderson National Guard soldier deployed overseas. Nevada is the 3rd most tapped state to have guard soldiers deployed. Currently 70% are deployed. Many times the soldier is not compensated for the pay differential and ultimately the families suffer. To make matters even more stressful, you can imagine these men and women digressing from their very important mission overseas to think and worry about their families at home. This puts them and their entire company in danger. This fund supports families in the 1864th, 777, 593, and 772nd companies of the 992nd Command. The purpose of the Henderson Libraries Foundation is to help the Henderson Libraries in its mission to create a literate community by providing financial support over and above the annual operating fund. The Police Honor Guard program was created to support police efforts in honoring fallen officers. The Police Honor Guard program may also provide support to families of fallen Officers in our community. The Henderson Senior Nutrition Fund serves the hidden hungry in our population. Over 700 at-risk seniors receive their only meals through important City of Henderson programs, including congregate dining, Meals on Wheels and senior wellness services. For many seniors, these meals may be the only thing keeping them out of nursing homes and enabling them to live independently. Donations help deliver these types of critical nutrition services to seniors. Family and friends of UNLV architectural student and Rebel Girl dancer, Lindsay Bennett, formed the Lindsay Bennett Memorial after she was killed in a tragic automobile accident by an alleged drunk driver in April of 2009. The Lindsay Bennett memorial will support multi-pronged educational and awareness programs within the community that will raise awareness for the responsibilities and the consequences of choices we ultimately make. Nevada Goes Falls Free Coalition provides sustainable evidence-based fall prevention programs to reduce the incidence of falls in older adults in Nevada. Nevada State College is committed to teaching excellence in the classroom. Your contribution to the Annual Fund allows the College to increase its level of student/faculty engagement by providing an educational environment in which top-tier faculty and students interact in small class settings. Nevada Veterans’ Alliance supports veterans in the community by subsidizing monies for the Veterans’ Treatment Court program, fast tracks veterans with medical needs to private doctors and clinical practitioners, and supports Veterans who are entering the small business arena with business mentorship, financial aid, and free legal counsel. HPD Community Relations partners with the community through various crime prevention and public relations programs (DREAMS, Every 15 Minutes, and Neighborhood Watch). The Partners with HPD K-9 program was established to provide additional support for the K-9 program. Funds may be used for protective equipment for the dogs along with training supplies and general equipment with the overall goal to enhance public safety. The SM@RT Connections program is intended to educate children and their families about the dangers of living in a continuously connected cyber world. The Veterans Treatment Court program is designed to enhance public safety and to hold veterans accountable for their conduct while providing an avenue for rehabilitation through treatment to address issues related to their military service. Nevada CSI is working to design, build, and equip a publicly-owned, operated, and maintained Forensic Science Center and they need your help! Make a donation and partner with Nevada CSI today! -- We will feature Nevada CSI here for 30-45 days, to help them get the ball rolling. The Henderson Community Foundation is a recognized 501(c)3 organization in the state of Nevada. Any contribution made is tax deductible to the extent allowed by the IRS and may be tax deductible. Learn how you can become HCF’s Friend?